On our Classic Tanzania Safari we enjoy safaris in some of the most famous National Parks of Tanzania. 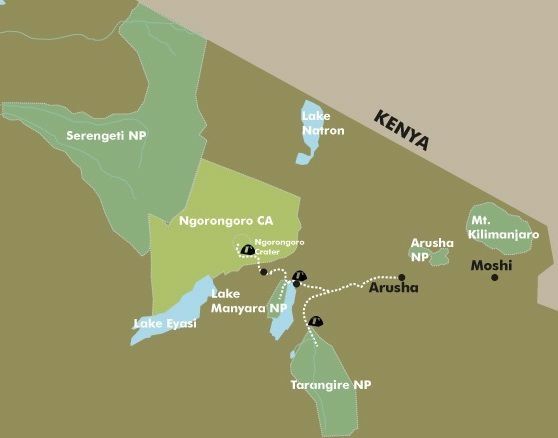 We visit the Tarangire National Park, Lake Manyara and the Ngorogoro Crater. You will see lots of wild animals in some pretty spectacular landscapes. We also visit the town of Mto wa Mbu where you will see lots of people from the Masai Tribe. This short safari is the perfect addition to our Kilimanjaro climbing packages since the dates all link together. Many of our clients also add a couple of days on the tropical island of Zanzibar for the perfect Tanzania adventure. Excluded: Flights, Sleeping bag, Optional activities, Alcoholic and soft drinks, Visa fees, Tips, Travel insurance, Personal spending money for souvenirs, etc. Our Classic Tanzania safari begins with a briefing about your safari and we travel southwest towards Tarangire National Park. This park offers a range of diverse landscapes and a great variety of wildlife. The park is one of the most densely populated areas for elephants and is home to some of the big cats such as lions, leopards and cheetahs. You should also be able to see lots of giraffes, buffalos, zebras and various antelopes and gazelles. The late afternoon will be spent in the national park with plenty of time for wildlife watching. Clients overnight at a campsite in a tent near the park gate. After breakfast youwill leave the Tarangire National Park area and drive via the town of Mto wa Mbu to the Lake Manyara National Park. This park with its shallow alkaline lake stretches along the base of the Rift Valley Escarpment. Lake Manyara attracts thousands of birds, including huge flocks of flamingos. Other animals in the park include buffaloes, elephants, hippos and Masai giraffes as well as troops of boisterous baboons and monkeys in the forests. The park once became famous for tree climbing lions and if you are lucky to spot them you will be amused by the site of these animals lounging on branches in the acacia trees. After a game drive (safari) in the park you will ascend to the Ngorongoro highlands, where you will overnight on a campsite situated on the crater’s edge with wonderful views of the caldera below. After breakfast we travel down the adventurous trail into the crater below. The Ngorogoro crater is the biggest crater in the world and a number of different animals have made it their home. Its grass steppes and acacia forests are home to almost all the species of animals found in the East African savannah. Here it is possible to see lions, elephants, buffalos, rhinoceros and leopards (the famous “Big 5”). After extensive wildlife watching and a picnic in the crater, you will leave the highlands of Ngorongoro in the afternoon and travel further to your campsite at Mto wa Mbu. After a leisurely breakfast you will start your journey back to Arusha where you will arrive in the early afternoon. Your safari ends here. and you can either continue onwards to the tropical island of Zanzibar, or fly back home, or climb Mount Kilimanjaro or even join one of our African Overland Tours though East Africa.